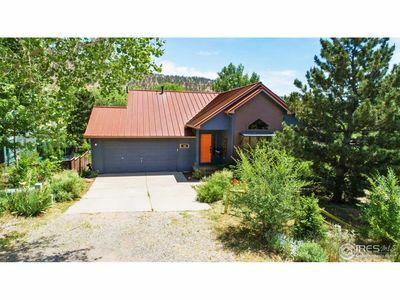 Perfect for family gatherings this four bedroom (plus sofa bed) two bath home can comfortably accommodate up to 10 people. 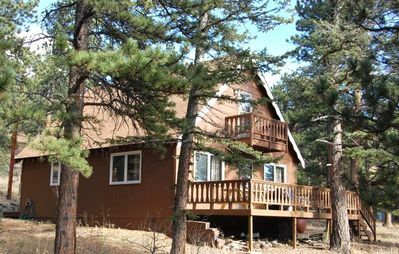 With two bedrooms on each floor and a sofa bed in the den, a large living room and kitchen that opens onto a deck, the house is great indoor/outdoor house and a hot tub, which is heavenly after a day of hiking. 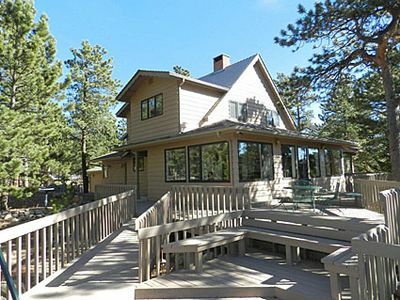 Lovely decks and outdoor gas grill make eating 'al fresco" easy and a true pleasure. 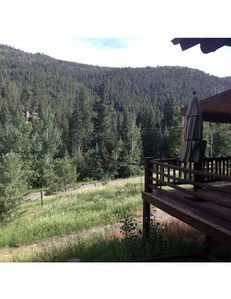 The wrap around deck with hot tub and outdoor grill is a great place for quiet morning coffee and wildlife viewing. 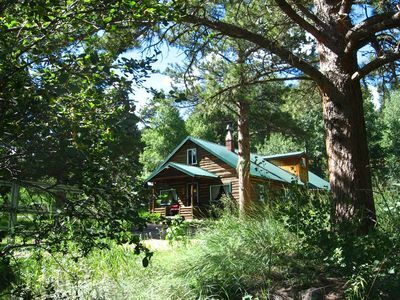 Guests report seeing lots of birds as well as elk, chipmunks, deer, bobcats and moose. This house has been a haven, a place to introduce new generations to the joy of the out of doors and a source of great family memories for us and it is a real pleasure to be able to share it with others. 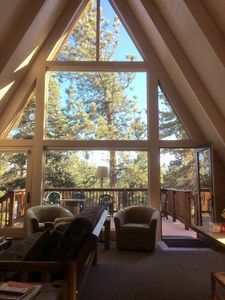 Every room has views of the ponderosa pine and aspen. There are views of Meadow Mountain, Twin Sisters and, now that we've been thinning the trees in the area, the magnificent Mt. Meeker. 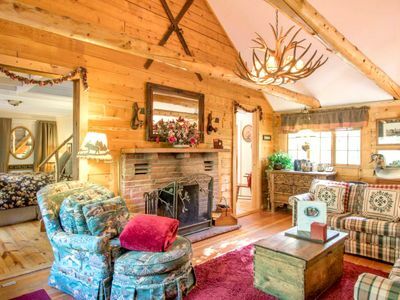 On cool evenings, the living room's wood burning stove is both warming and inviting. The house is fully equipped with washer/dryer, wifi, and directv. AND WE ARE PUTTING IN A NEW KITCHEN THIS WINTER, WITH NRE APPLIANCES AND A DISHWASHER, ( yippee!!) 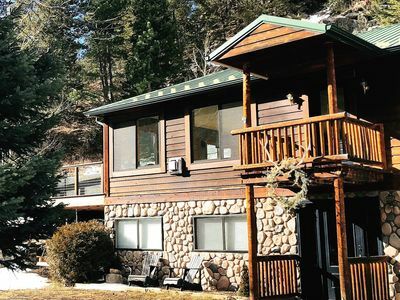 For larger groups, The Solitude Cabin (Property #1081104), a three bedroom house just up the hill can also be rented, providing proximity but also a little privacy for big family reunions. 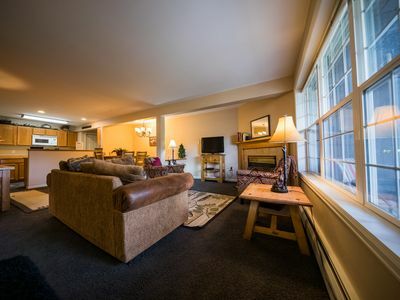 Two bedrooms and a bath are situated on the lowest level. One has a king bed and a comfortable sitting area for when one just needs a bit of a break from the rest of the family! It shares a bathroom with a second bedroom. This one has a queen bed. 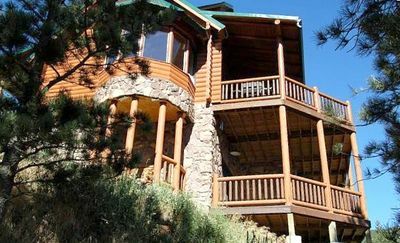 The middle level has a great room with a fire place, fantastic windows, a dining area that often accommodates as many as 20 people. This level also has a separate space for working or reading. The overflow sofa bed is here. 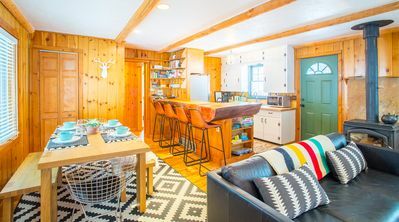 The kitchen is also on this level. The second bathroom and mudroom are also at this level. Up above are the other two bedrooms. One has a queen bed and the other a full. The bedroom toward the front has such beautiful views of the stars as it has a wall of windows. 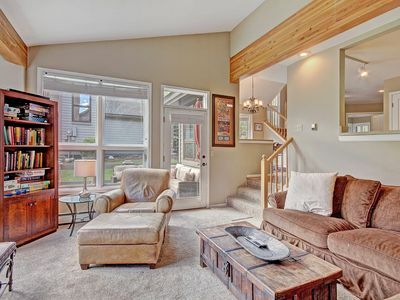 Many guests enjoy the ability to be all together but also to have the separate spaces that the house affords. 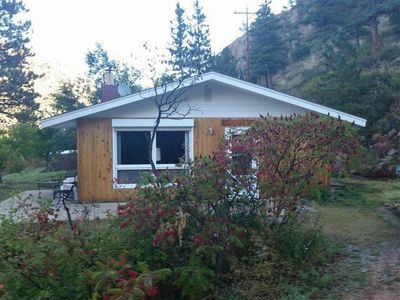 The house is a half mile walk to stables and a small grocery store. In fall, it is a great place to view the autumn foliage and in winter the area offers fantastic show shoeing. 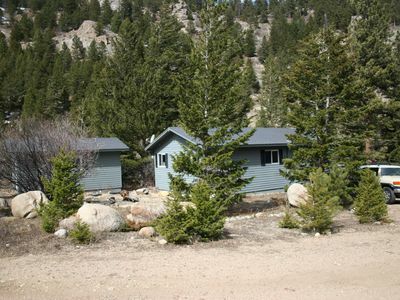 We are also about 45 minutes from the Eldora Ski area where all the Boulder regulars choose to ski. 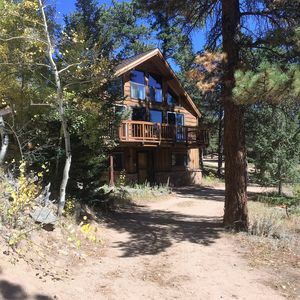 Many guests enjoy the easy access to Rocky Mountain National Park and Estes Park but love the quiet that comes from being away from both. 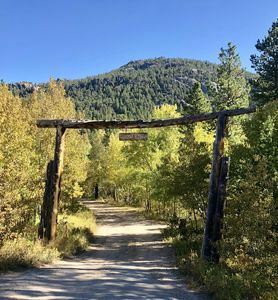 Some guests find that enrolling their children in the day camp at YMCA of the Rockies allows them to do strenuous hiking while their children are occupied. 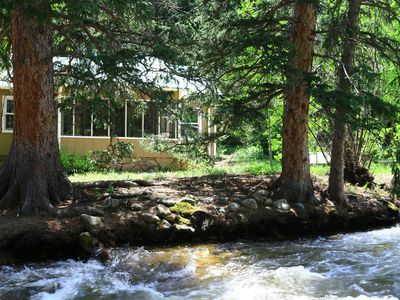 Retreat to the River.....and let the adventures begin! 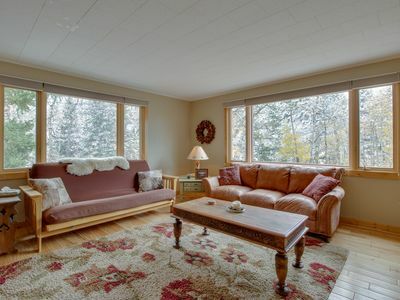 WD25 Wonderful Town Home Boasts Incredible Views! 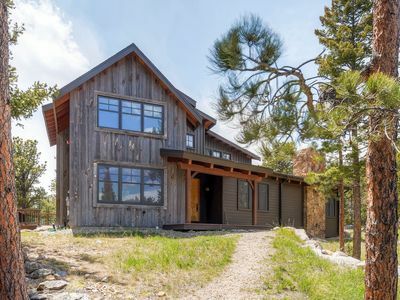 Newly remodeled mountain cabin near Estes Park and Lyons! 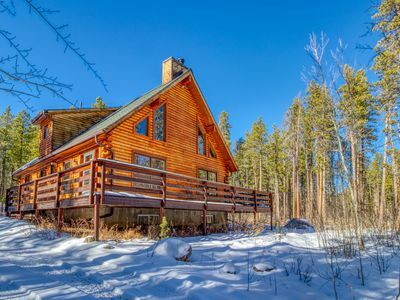 WALK TO TOWN from this cozy, quiet 3BR 5 mins from National Park.